Crisp HD audio and video is yours with stereo analog/digital audio inputs and embedded HDMI audio output. 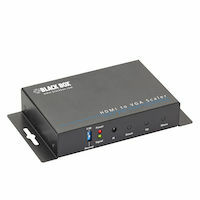 HDMI to Video Converter and Scaler supports intelligent color adjustment for hue, saturation, sharpness, brightness, and more. EDID (external display identification data) management system ensures correct content is displayed. 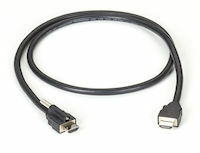 Locking connectors ensure signal will not be lost due to poor connectivity. Start working with products right out of the box. Just plug in and play. Wall-mount housing design for easy installation. 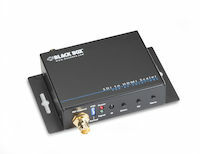 Supports noise reduction and video enhancement features. Versatile control with front-panel push button control and IR remote control. The HDMI to Analog Video Converter and Scaler comes with a standard 3 Year Double Diamond™ Warranty (Standard) already included. 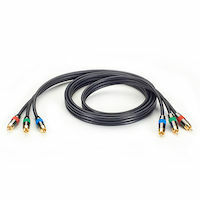 Component Video Cable - (3) RCA on Each End, 1.5-ft.